Baking is an art and I am still a learner. In India we never owned an oven to try all those baking goodies at home. If we felt like eating cakes, breads, delicious pastries and rolls we used to depend on small bakeries in our town. I remember when I was in 12th standard Monginis was the first ever brand name in baking I knew of! 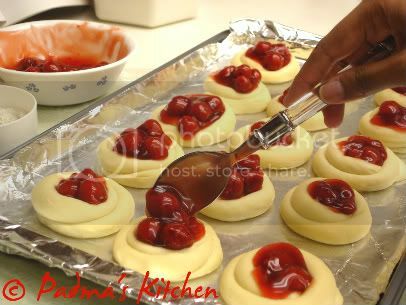 So after coming to land of opportunities[US], baking is one amongst other few arts which I learned here. More on how I used my oven when I was new to it, you can read it from here. I slowly gained momentum in baking all the goodies and well but consider myself still at a learning stage only. Last week I brought some books on baking from our local library. 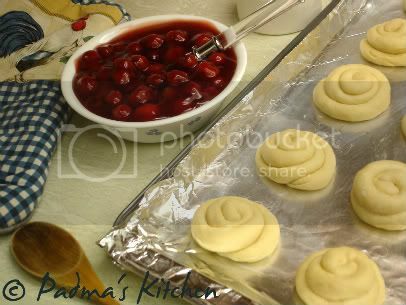 Cherry rose rolls caught my eyes while browsing out for some new recipes from the Sourdough Cookbook by Rita Davenport. For more on Baking with the Sourdough, I will draft few points from this book and post it separately for all Enthusiastic Bakers. Keep watching!! In a small saucepan, heat 3/4 cup milk almost to a boil over medium heat. Do not boil. Set aside to cool 10 minutes. Sprinkle yeast over water, set aside to soften 5 minutes. In a large bowl, combine sourdough starter, cooled milk, softened yeast mixture, butter or margarine, granulated sugar and salt. Stir in enough flour to make a soft dough.Turn on to a lightly floured surface. Clean and grease bowl; set aside. 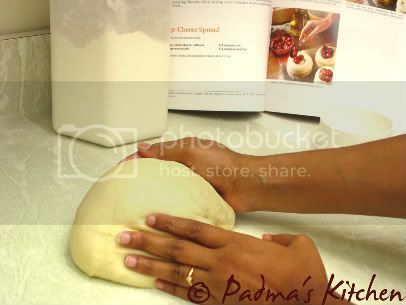 Knead dough 5 to 8 minutes or until smooth and elastic. Add more flour if necessary. Place dough in a greased bowl, turning to grease all side. Cover with plastic wrap. Place in refrigerator 2 hours or overnight. Grease a large baking sheet; set aside. Punch down dough. Turn onto a lightly floured surface. Divide dough into 24-30 equal pieces. Gently roll each piece between your hands to a 12-inch rope. On prepared baking sheet, loosely coil each rope, tucking end of rope under coil. Leave 2 inches between coiled ropes. Cover with a cloth and set in a warm place free from drafts. Let rise 1 to 2 hours or until doubled in size. Preheat oven to 400F (205C). Press the center of each roll with your fingers until you touch baking sheet. Make indentations about 1 inch wide. Spoon cherry pie filling into each indentation. Bake in preheated oven 15 to 20 minutes or until golden brown. Remove from baking sheet, cool on a rack. For decorating, In a small bowl, combine powdered sugar, vanilla and 1tablespoon milk, Beat until smooth. Spoon into a pastry bag. 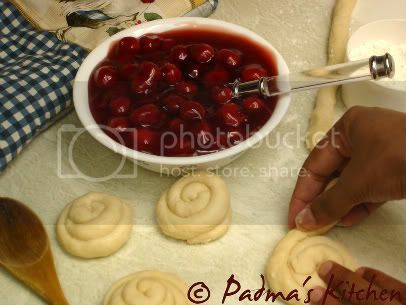 Decorate rolls by pressing mixture through a tip with small opening. This weekend (19th July 2008) we went to Dorney's Park near Allentown, PA. It has both Wildwater Park and Amusement Park. We thoroughly enjoyed and had aches and sores by the end of the day! I took these rolls for snacking and everyone in our group enjoyed having them. So, its a nice picnic snack too! it's sooo long since i visited your blog, and look what i see!!! beautiful rolls and pics. Those are really pretty, you did such a nice job! Wow, what else can i say? I am speechless... So delectable rolls, they look awesome. wow, those rolls look like real roses. What a delicious recipe! Thanks for visiting my blog. You have a nice blog too with so many yummy andhra specials. I also started baking recently......from your rolls you seem to be a pro. Till recently I used to hog on monginis cake. Yaay.. padma you are back! What beautiful looking rolls these are - they absolutely do look like roses. Yummy. As for your qn about replacing spinach in Spanokopita.. i'm not sure if how other greens would work - sorry... but maybe you can give it a try. You are back to blogging. I missed your pics Padma. Don't vanish once again. These rolls are so colorful and festive! Thank you for sending them to YeastSpotting. Very very pretty and delicious, Padma. Btw Padma, I have added you to my Blog Aggregator at http://foodworld.redchillies.us. These rolls look very yummy and lovely!!! These look fantastic! Beautiful rolls and photos! Those look absolutely divine! I'm inspired to whip up something with the fresh blueberries I have. Padma! I am completely bowled over by the beauty of these rolls. You have expertly replicated the recipe! These look amazing! I saw the picture on the BBD roundup and had to come and have a look at how they were made! What an awesome way to present this bread. I love the amount of detail that goes into your posts. Wow! 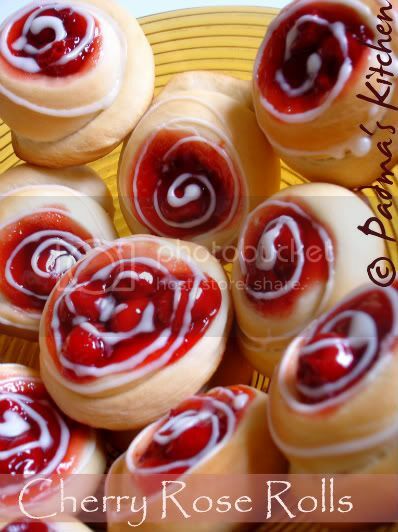 this cheery rose rolls looks so scrumptious with the picture, I'm sure it'll be a big hit with the kids! 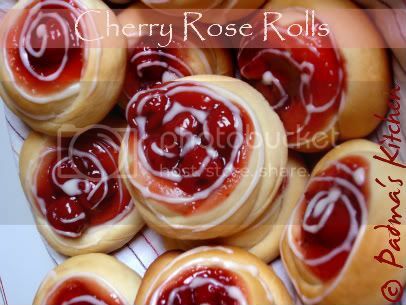 Although I'm to a big fan of cheery rose rolls, this sure looks yummy! I'm normally the one that will say no to rose rolls. thank you for shearing your post. 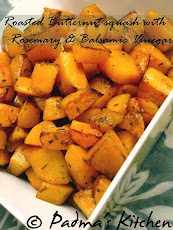 Thanks for sharing such a great recipe and it's helpful for everyone. Great Post! Really your site is too wonderful. Carry on your good work and share your information from us. It's really looking yummy, Thanks for the recipe. 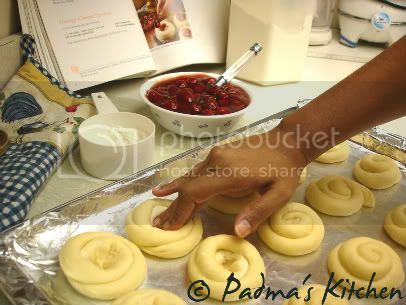 such great blog about how to make cherry rose rolls I believe that it prove to be very useful for the readers as well as..